In the core Tesco UK business, third quarter like-for-like sales increased by 0.7%, representing the company's twelfth consecutive quarter of growth. In a more challenging market, Tesco said it made significant further improvements to its customer offer. Over 74% of its 10,000 own brand products had been relaunched by the end of the third quarter, with the roll-out of its ‘Exclusively at Tesco’ range 95% complete. As expected, Tesco said, and following a step-up in the marketing of ‘Exclusively at Tesco’, saw an increase in customers trading into the exceptional value offered by these products. Whilst this, and the initial disruption as it rolled out the new ranges impacted the value of like-for-like sales, by the end of the third quarter overall UK sales volumes were outperforming the market. This positive momentum continued into the Christmas period where Tesco's like-for-like sales grew by 2.2%, outperforming the market in both volume and value terms. The company's online like-for-like sales increased by 2.6% over the Christmas period. In general merchandise the popularity of our exclusive Fox & Ivy homeware and Go Cook cookware ranges contributed to overall like-for-like sales growth of 7.7% in these categories during the 19-week period. 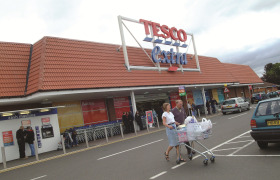 This helped to partially offset an overall decline in general merchandise sales which impacted overall UK like-for-like performance in the period by (0.2)% as Tesco continue to reposition its offer, the business said. Clothing sales increased by 3.8% during the period, aided by a particularly strong womenswear performance. Like-for-like sales in the Republic of Ireland were flat over the 19-week period, against a strong performance last year. In a more competitive market, driven by increased couponing activity, customers responded well to the Christmas offer with positive volumes across key fresh categories. Dave Lewis, chief executive of Tesco plc, said: “As a team we have achieved a lot in the last 19 weeks. In the UK we delivered significant improvements in our competitive offer and this is reflected in a very strong Christmas performance which was ahead of the market.